Cheese, lettuce,tomato and mayo on french bread. Thanks to everyone for visiting and your comments ! Nice ending to the month. I hope you enjoy the jubilee truffles, they looked scrummy. 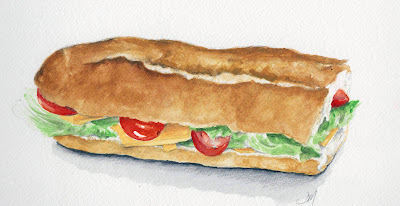 Wonderful rendering of this yummi french sandwich . what a yummy sandwich! I just saw that you did the May challenge. Great series of pictures. You did a great job. I so hope to get better at doing something every day.